The weakest newborns are fed parenterally. That is, they receive nutrition intravenously because they’re unable to eat. In spite of FDA guidelines, these most helpless of infants are receiving massive doses of aluminum, a toxic metal with no place in human metabolism. Research demonstrates that these guidelines are universally flouted to a shocking degree, leaving the weakest among us to live with a highly toxic burden of aluminum. Denise Bohrer is a leading researcher on this topic, who presented at the 2013 Annual Keele Meeting on Aluminium, the world’s most significant source of information on aluminum’s biological effects. Her research focuses on the severity of this problem in parenterally-fed infants and adults, usually elderly, along with the sources of contamination. This article focuses on the work that she and her team are doing. These adverse effects are most notable in people with defective kidney function. Two groups noted for it are premature newborns and many elderly people, which explains Dr. Bohrer’s focus. In “Aluminum loading in preterm neonates revisited”2, Bohrer et al demonstrate that more than half the aluminum fed to infants parenterally ends up sequestered in the body. They also found that the aluminum does disappear from the blood stream. Therefore, if it is not excreted in urine and doesn’t continue circulating in the blood, it is left to act toxically on the child’s body. Ten premature infants fed parenterally were the subjects. The infusion bags and other apparatus that were used to feed and administer drugs were collected. To calculate urine volumes, diapers were collected and weighed before and after use. Urine samples were collected once a day. Blood was collected at birth, upon admission to the neonate intensive care unit (NICU), and again on their last day in the NICU. The amount of aluminum administered to each bay was calculated based on known levels in each of the products. The study found that the average (mean) daily intake of aluminum was 28.5 µg, with an average daily intake of 15.2 µg/kg/day. The average (mean) daily intake of aluminum was calculated to be 15.2 µg/kg of body weight. Note that the maximum intake level that the FDA considers acceptable is 5 µg/kg/day, which means that these babies were receiving over 3 times more than the FDA considers acceptable. The average daily amount excreted was only 9.3 µg. That left an average of 19.2 µg in the babies’ systems. The range of intake from baby to baby was quite large, but the smallest average calculated was 7.2 µg/kg of body weight and the largest was 23.2 µg/kg of body weight. It is, of course, to be expected that this difference would occur, since kidney function would have varied from child-to-child. Note, however, that even the lowest intake was nearly 50% higher than the FDA’s maximum. The reason this study was titled with the term “revisited” is that it’s been more than 30 years since the issue of aluminum toxicity from parenteral feeding was noted. Therefore, this study made a comparison between studies done 20-30 years ago and their own today. They found that there has been no improvement in all that time. In spite of the FDA’s ruling that aluminum be kept below 5 µg/kg/day, nothing has been done to resolve the problem. Until Bohrer and her team decided to take another look at this issue, the science community had largely been silent. There has been little in the science journals in the past 20 years. This has allowed the FDA’s regulation to be ignored, and our weakest people, premature infants and the elderly, to be routinely poisoned with a substance known to cause neurological and bone damage. The next question must be what’s the source of all this toxic aluminum? Can’t it be avoided? Dr. Bohrer and team worked on this question, with a most telling result reported in “Aluminum content in intravenous solutions for administration to neonates: role of product preparation and administration methods”3. The FDA has issued two definitive rules on the topic. One, discussed in the previous section, says that no more than 5 µg/kg of aluminum should be given per day. They also ruled that parenteral nutrition must not contain more than 25µg/liter of aluminum. Keep that figure in mind: 25 µg/L. For two weeks, Bohrer and team collected samples from the hospital at the Federal University of Santa Maria in Brazil. They collected the bag and burette sets that hold and deliver nutrition and drugs. Medicines, samples of the commercial parenteral nutrition, and infusion examples were collected. All materials collected before use were again collected after use. Note that, although medicines were found to contain significant amounts of aluminum, their volume was low so they did not account for the most significant amount of toxicity. It’s readily apparent that a very high percentage of these products is well over the FDA’s limit of 25 µg/L. Note in particular the calcium gluconate 10% figures, which are simply astronomical. Of the high volume products, Water for injection, glucose 50%, amino acids, and lipids, three samples were over the FDA’s limit of 25 µg/L. These were both amino acids by Fresenius-Kabi and Baxter, and one lipid by Fresenius-Kabi. Note also the dramatic difference between the two batches of Fresenius-Kabi lipids. Obviously, a significant amount of aluminum is added to the already toxic levels of the components provided by manufacturers. The smallest final measurement, that found in the burette right before release to the neonate, was 61 µg/L, more than double the FDA’s maximum allowable level of 25 µg/L! Containers may increase the contamination, because practically all materials used to manufacture containers for pharmaceuticals contain Al, either as a constituent or as an impurity. Aluminum oxide is a glass component; in addition, the more resistant the glass the higher the oxide content, so that in glasses for parenteral formulation Al can reach 6% of the total glass mass. Plastic containers may also contain Al, in this case as an impurity, because Al compounds are used as catalysts in plastic polymerization. Pharmacopoeias limit the extractable Al from polyethylene, polypropylene, and PVC to 1 ppm,18 which is much higher than 25 mcg/L, the amount proposed by the FDA as a limit for large-volume parenterals. Therefore, Bohrer and team also examined the containers for aluminum contamination. They investigated the calcium gluconate 10%, which you can see in the first table had exceptionally high quantities of aluminum, 9,205 and 19,400 µg/L. Calcium gluconate forms a large percentage of the neonates’ parenteral formulas. They estimated that it’s responsible for 80-98% of the aluminum found in parenteral formulations. New unused infusion sets of bags, tubing, burettes, and syringes used for medications were filled with sterile water and left to soak for 24 hours. Samples were taken and examined for aluminum content. The results are shown to the left. 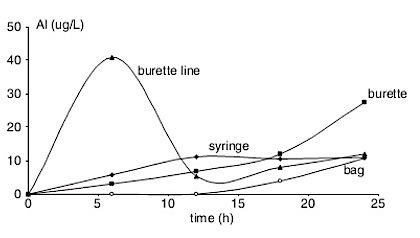 You can see that the burette line rapidly contributes the lion’s share of aluminum to solutions, and the burette contributes a significant share after about 18 hours of use. Syringes and bags also contribute to aluminum toxicity, though not as significantly. As is clearly documented by Dr. Bohrer and team of scientists, the recommendations of the FDA are nearly universally flouted in feeding of our weakest citizens, the youngest and oldest. Aluminum is a noted toxin causing permanent and devastating damage to the neurological system and bones, resulting in chronic pain and disability. Normally, aluminum is easily eliminated in the urine. Adult patients with renal compromise and neonates are the patient populations at greatest risk of developing toxicity from the aluminum present in parenteral fluids. However, the amount of aluminum in all of the neonatal and pediatric solutions tested exceeded the FDA limits. Canada’s parenteral products have 7-10 times less aluminum than those of the United States. Mirtallo reports that it’s because Canada’s products use organic phosphorus instead of inorganic salts. According to Mirtallo, Germany successfully reduced aluminum concentration by 96% simply by requiring that calcium gluconate be packed in polyethylene vials instead of glass containers. If it’s that easy to reduce aluminum to only 4% of current amounts in food fed to premature and undersized infants, why are the manufacturers and hospital workers who prepare parenteral feeding not doing the right thing? Clearly, there are solutions to the wholesale poisoning of the oldest and youngest patients. They are neither complex nor difficult. The most innocent and weak among us surely deserve better than such cavalier treatment by the corporations that profit off them and the hospitals responsible for their care. This is the first of a series of articles based on the 2013 Annual Keele Meeting on Aluminium, a conference on the biological effects of aluminum. I was thrilled to be invited to this year’s conference in Winchester, England to act as a reporter. Aluminum is the most abundant metal in or on the earth, and the second most abundant element in the earth’s crust. Thoughout most of the earth’s history, it’s been tightly bound and tucked away, having little effect on biology. However, it’s a most amazing element, which readily binds with others to form highly useful products. Since we’ve discovered that, it’s been a gung ho process to strip it from the earth, find more and more new uses, and apply them. Sadly, though, that ability to combine with nearly anything makes aluminum highly disuptive in biology, where it has no metabolic value. It is, by definition, a poison. A dedicated group of scientists are interested in and concerned with these effects, and do serious and valuable research in spite of industry’s lack of interest. The harmful effects of aluminum are not generally profitable, so research on them is limited. Nonetheless, these scientists have dedicated themselves to the benefit of protecting humans and the earth, rather than simply bending to profits. I was humbled by the presentations. My hope is to present some of the information in a form that is readily accessible to the nonscientist and does fair credit to the work of these scientists. We need to be aware of all the effects of aluminum, this most amazing, but also toxic, substance. 2. Aluminum loading in preterm neonates revisited. Bohrer D, Oliveira SM, Garcia SC, Nascimento PC, Carvalho LM. ; doi: 10.1097/MPG.0b013e3181cea511. 3. Aluminum content in intravenous solutions for administration to neonates: role of product preparation and administration methods.Journal of Parenteral and Enteral Nutrition; de Oliveira SR, Bohrer D, Garcia SC, do Nascimento PC, Noremberg S.; doi: 10.1177/0148607110362531. 4. Age dependence in the accumulation and elimination of aluminum in rats; Page 57, Marlei Veiga, Sandra Ribeiro, Patrícia Mattiazzi, Cristina Bandero, Queli Lenz, Mauro Silveira, Carlos Mello, Denise Bohrer. 5. Aluminum Contamination of Parenteral Fluids; Journal of Parenteral and Enteral Nutrition; Jay M. Mirtallo, MS, RPh, BCNSP, FASHP; doi: 10.1177/0148607110361906. 6. 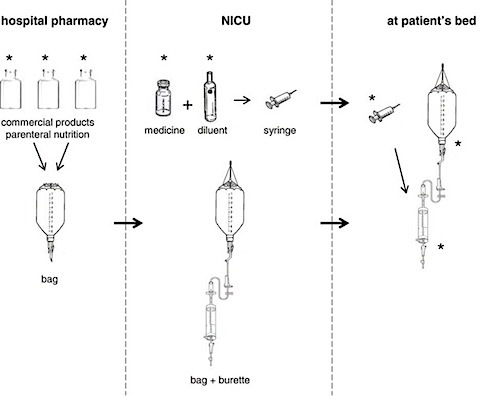 Aluminum in large and small volume parenterals used in total parenteral nutrition. FDA’s guideline on labeling aluminum products for use in parenteral nutrition. Listed below are links to blogs that reference this entry: Failing Our Weakest Newborns: Poisoning with Aluminum. This page contains a single entry by Toni published on March 18, 2013 4:44 PM. Parental Fears Toward HPV Vaccines Is Growing is the next entry in this blog.